This is the first blog post in a series on one of the most awesome free analytical tools that is to be found around – NodeXL. 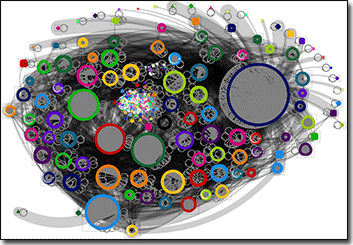 What is NodeXL? 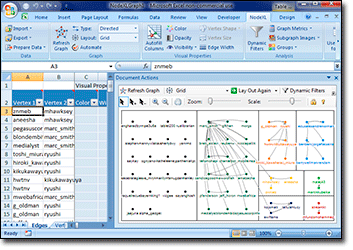 NodeXL is a free template plugin for Excel 2007-2013 that is allowing you to explore Network Graphs. Why Networks are so important? Because everything is interconnected – every person is talking to other person, thus creating a global network of the relationships, every Computer is connected to some other computer in the internet, and most of all – every atom has a relationship to other atoms – thus creating probably the biggest Network. Everyone is keep on talking that Social Networks (such as Facebook or Tiwtter) are some of the most important things that happened since the internet inception, but it is still extremely difficult to get a bigger picture of what is going on some specific topic or event. You might be interested in finding out which Nodes are the most important in the network (which is a very interesting question itself, because the importance can be seen from so many different angles). It has been a very difficult task to find out anything without involving a number of specialists who would be able to develop a whole ETL process; we would need a number of specialists who would develop a visualisation solution to be able to show the found data and to allow the final user to play with the results. Created by Social Media Research Foundation (and more precisely by Mark Smith, who spent a number of years at the Microsoft Research), this great free tool allows you to understand a given Network. If you want to create some stunning visual presentations proving your analysis, you can do it within a couple of minutes by using NodeXL. Being constantly developed and updated, NodeXL supports a number of different Networks from which it allows to import information directly without exiting the world of Excel. Between supported networks you can find: Twitter, Flickr, Youtube, Facebook (additional plugin required), Exchange (additional plugin required) and much more. All above the support for the GraphML standard seems to be one of the most important feature in the current world of openness & interoperability. Before we start with the real functionalities of this tool, I would like to mention an amazing website that contains hundreds (if not thousands) of the real world examples of analysis – NodeXL Graph Gallery. Visit this site to see what can be done and to become inspired before exploring all possible options that NodeXL is offering. Armed with an automated update in order to accompany all supported social networks API changes, there are virtually no things you need to be doing in order to keep the tool up to date. NodeXL is aiming to become the Paint of network visualisers and I honestly believe that it is on the very good way to fulfil its mission. I have made a number of presentatiosn on this amazing tools in Portugal, Saudi Arabia, Ukraine, Germany, Denmark, Scotland, Ireland & USA (PASS Summit 2013), and I know enough people all around the world, who are showing this tool to friends and at the local PASS Communities, as well presenting it to the clients. Why am I doing this ? Because I am a believer in this tool and I personally see the advantages that it is bringing to everyone. Download NodeXL now and start analysing the Networks. Thanks for the kind words! The Social Media Research Foundation is proud to support the development and maintenance of NodeXL. Our goal is to support “Open Tools, Open Data, Open Scholarship” related to social media. Thank you for the comments, Marc!